Located within walking distance to Warner Brothers, NBC, and Disney . Two miles to Universal Studios , 3 Miles to Bob Hope Burbank Airport and 4 miles to Hollywood. Disney , Warner Brothers and NBC Studios are just a few of the nearby major production companies within a couple of blocks of the Best Western Plus Media Center Inn & Suites. Spend half a day touring Warner Brothers or watch filming at NBC. Universal Studios Tour is just a minute's drive time from us, as is Hollywood Boulevard and its famous Walk of Fame and Hollywood Bowl. If you love good food, you can walk to the numerous fine eating establishments near our inn or drive a short distance to some famous restaurants in or near Burbank. 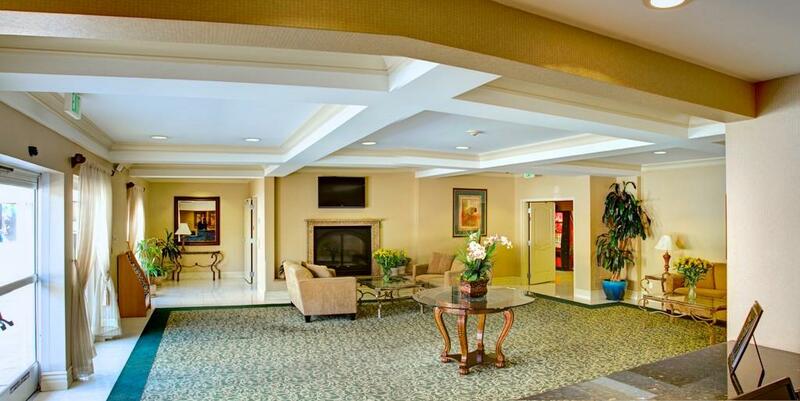 For your stay at the Best Western Plus Media Center Inn & Suites, you'll enjoy a complimentary continental breakfast, 24-hour fitness center and pool or just enjoy your free high-speed wireless or hardwired Internet in all our rooms. A well-equipped business center is also available. Enjoy your stay. From: The north. Take Interstate 5 to State Route 170 to State Route 134, exit at Pass Avenue. Make a right turn on Pass Avenue to Riverside Drive. Turn left on Riverside Drive. The Best Western Plus Media Center Inn & Suites is just ahead. From: The south. Take State Route 101 North and exit at Barham Boulevard. Turn right on Barham Boulevard to Hollywood Way. Turn left on Hollywood Way to Riverside Drive. Turn left on Riverside Drive. The Best Western Plus Media Center Inn & Suites is just ahead. From: The east. Take State Route 134 and exit on Hollywood Way to Alameda Avenue. Turn left on Alameda Avenue to Hollywood Way. Turn left on Hollywood Way to Riverside Drive. Turn right on Riverside Drive. The Best Western Plus Media Center Inn & Suites is just ahead. From: The west. Take State Route 101 to State Route 134 and exit on Pass Avenue. Turn right on Pass Avenue to Riverside Drive. Turn left on Riverside Drive. The Best Western Plus Media Center Inn & Suites is just ahead.